This morning we received part of our Autumn/Winter order from Toggi and Hoggs of Fife, and we have to hand it to the buying team for another season of excellent choices. BUT! Here's the surprise we discovered...the coat has the most gorgeous lining! So much so that some of the team instantly wanted to buy one. Don't get us wrong, all our suppliers are top quality brands and always give The Country Catalogue the highest support with photography and product descriptions - but we love these little surprises as the enthusiasm it generates is infectious! And guess what? It also matches the Toggi 'Swallow' Scarf (£15). And not forgetting the men. 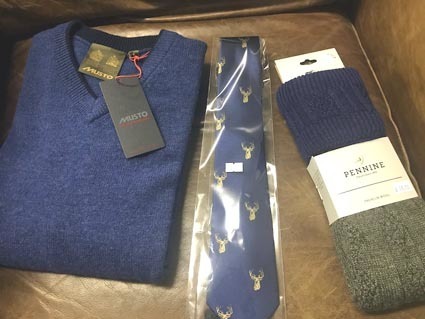 Blue is the colour this Autumn, and the new Musto 'Lake' Shooting V Neck (£85) goes so well with the new Pennine Defender Shooting Socks (£19.50) and our Woven Silk Stage Tie (£20). It's like they were made to be together!